Lasith Malinga insisted making World Cup history counted for little after Sri Lanka lost their Super 8 match to South Africa in thrilling fashion. The seamer took four wickets in four balls for the first time in international cricket history, but the Proteas edged to a one-wicket win. 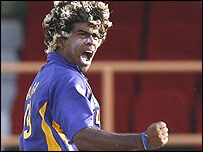 And Malinga said: "I am happy to take those wickets but we have lost. "I felt good, mixed my deliveries up well, and I thought we might pinch it. But 209 was not enough to defend." Sri Lanka skipper Mahela Jayawardene agreed, and admitted the crucial period was at the end of their innings when they lost five wickets themselves in quick succession. Tillakaratne Dilshan and Russel Arnold shared a 97-run partnership to boost the Sri Lankan total, but Charl Langeveldt took three wickets in an over as the last five wickets fell for 14 runs in 22 balls. And Jayawardene said: "We made a lot of mistakes with our batting, throughout the line-up to be honest. "But the crucial moment was right at the end of our innings when we lost five wickets cheaply and failed to bat our overs. It left us short of a decent total and put us under pressure in the field. That will haunt us later." He added: "This was definitely a game for us to win, but we never had a chance of winning except for that last burst from Malinga. "It needed something like that to change the game. We were thinking they would win pretty comfortably, [but] they panicked a bit and with three runs to get with the last wicket, it gives you hope - but it wasn't to be. "We fought well, though, and credit to the bowlers because they were magnificent. We will take positives from this and we can battle back."